Above scan (the series' logo and summary panel couldn't fit my scanner) is of the third installement of the swashbucler comics 'The Buccaneers' serialized in Britain's Mickey Mouse Weekly between no. 's 194 (Oct. 21st, 1939) - 205 (Jan. 6th, 1940). The hero is a captain who, after a mutiny, is put on a boat together with his loyal men and left on open seas. 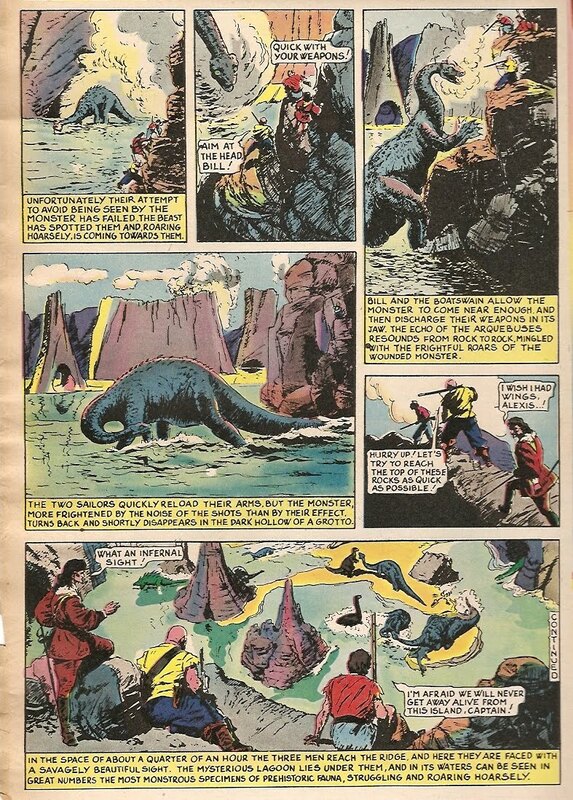 They land on an island with dinosaurs, but the main plot is about the captain's fight against pirates. 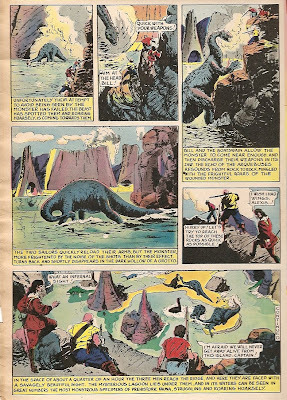 It all ends with a volcanic eruption, of course..
'The Buccaneers' had replaced 'King of the Royal Mounted' in the magazine's color central pages and I am not sure if it is another imported comics or a British production. I've been following your blog for some time and am really enjoying it, especially the items on old Turkish comics. I recently bought a copy of 1001 Romans(issue 188 from 1943), which i believe once belonged to British comics historian Denis Gifford. Regarding the identity of the artist on the Buccaneers strip (from Mickey Mouse Weekly). This was an American reprint, although I can't identify the artist's name.